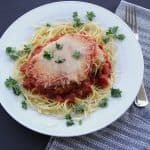 How to Make Restaurant Style Chicken Parmesan at home! 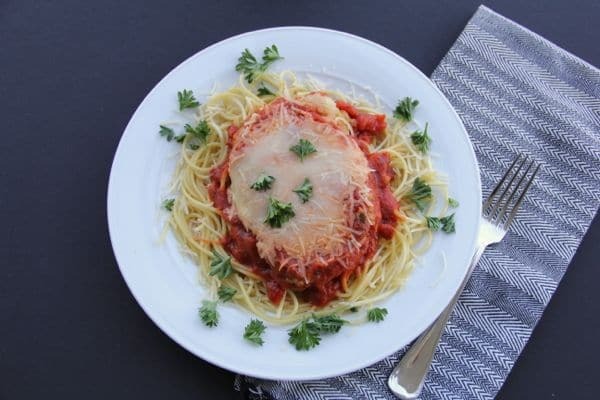 Learn to make restaurant style Chicken Parmesan to enjoy from the comfort of your own home. 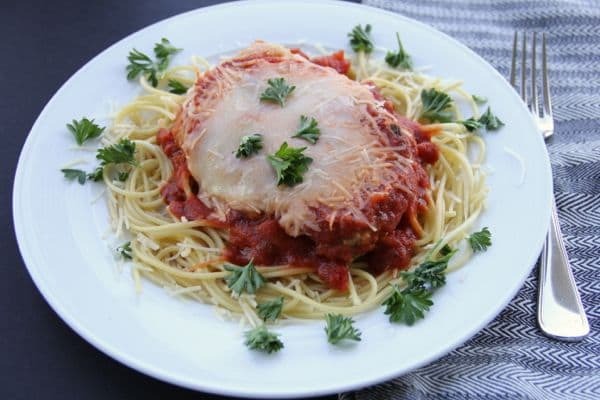 I always used to order chicken parmesan at italian restaurants. Then I mastered this recipe. Now I won’t even try it when we go out because most restaurant’s just can’t compete! That’s how good this recipe is! 2.5 lbs boneless skinless chicken breast, sliced thinly into three thin pieces per breast. Pulse 1/2 the parmesan cheese with breadcrumbs in a food processor. Dip the chicken breast slices in the milk and egg mixture, then in the breadcrumb mixture. Heat olive oil in large skillet over medium high heat. Brown the chicken in the oil on both sides until golden, about 2-3 minutes on each side. The chicken does not need to be cooked throughout because it will finish baking in the oven. Typically I change my oil 2-3 times while cooking to avoid burnt blackened crumbs. Lay chicken in 9×13 baking dish. Spread the sauce over chicken, then spread the rest of the cheeses over the top. Bake covered at 350 for about 25-30 minutes or until bubbly, remove cover for last 5 minutes of baking. Typically I double the ingredients and fill 3-4 tin casserole pans. This recipe freezes also really well. 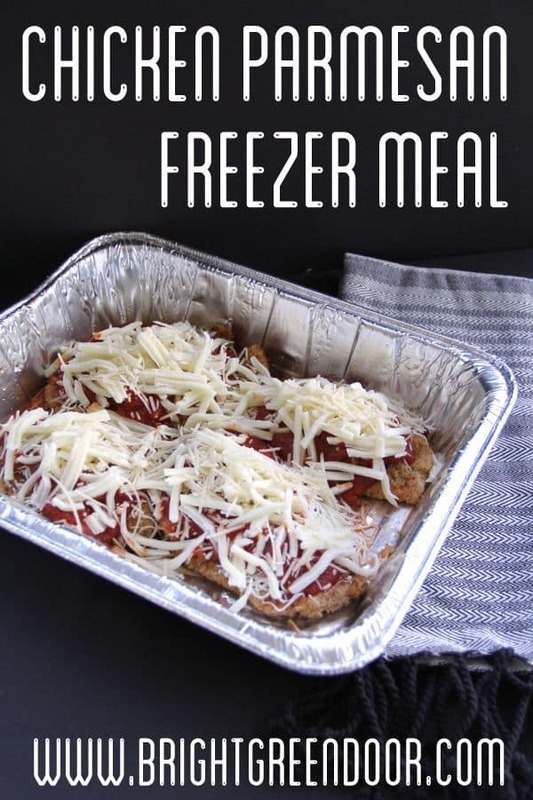 To freeze it I just assemble the chicken in a foil pan and pour the sauce and cheese over the top. Then I cover it with foil. Then when we’re ready to eat it I just thaw it for 24 hours in the refrigerator and then cook at 400 for 40 minutes. 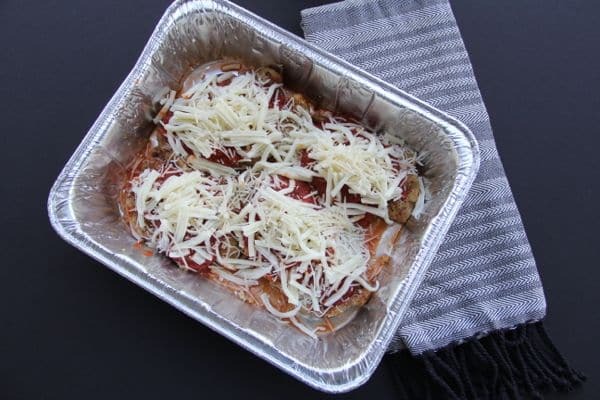 Restaurant style chicken parmesan is one of my favorite meals to deliver to friends as well. Before delivering the meal I just cook the spaghetti and slide it under the chicken. I love making it in these foil pans so there is nothing to have to return. When paired with a bagged caesar salad and some good bread it’s a perfect meal. Do I still brown the chicken before freezing?